When out training it is inevitable that you will ride the same roads over and over again, this repetition can breed boredom even on the most shred worthy routes. 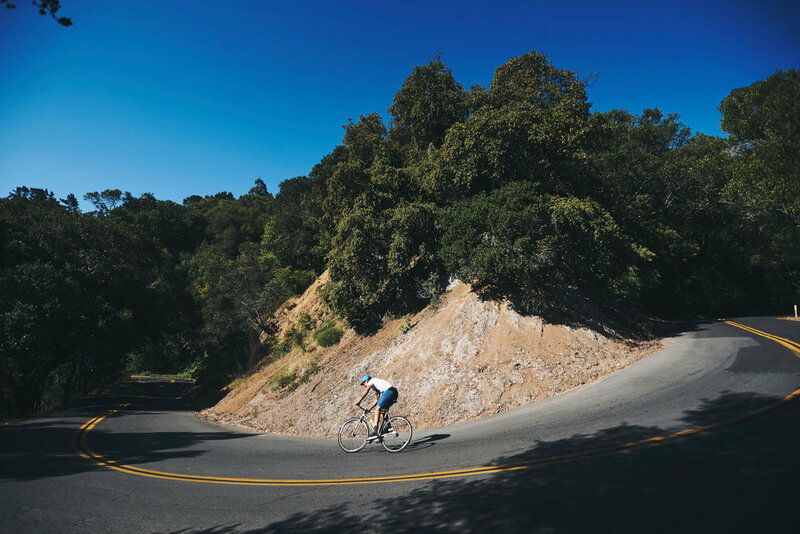 For me one of these repeated rides is PineHurst road in the Oakland hills, while this is one of the raddest roads right in my back yard I ride it 3-4 times and week and sometimes it can get a little stale. So I decided to mix it up a little bit and bring out my street shredding track bike and get stoked on PineHurst road again!! My friend Francois LeBeau came out to document some tire ripping descents and leg shredding climbs, sometimes you just need a new perspective to get stoked all over again!! PineHurst road is one of the quickest ways from where I live in Oakland over the East bay hills and onwards to the longer rides like Mt. Diablo. Sometimes it can be the majority of a quick morning spin or it can be the start and finish of an epic day on the bike. The top is usually warm and sunny but as you descend the twists and hairpins down into Canyon it can get cold and wet very quickly. It was only after I moved here and started riding it frequently that I understood why Dustin Klein named a Cadence windbreaker after the road, Most of the time you need to add or remove a layer at least once while riding it. The day we got out was a blue bird day of warm sun and dry roads ripe for shredding. You know its steep when even the photo makes you want to shift into your little ring..
Been really stoked on the new MASH work frame, the few geometry changes we applied to our first offering really helped increase the the aggressiveness of the frame with still keeping it responsive to rider input. While I really like the frame for criteriums, and it absolutely SHREDS at TrackCX, I think it is still best suited for good old fashion asphalt ripping. The Deluxe Cycle integrated Titanium bar stem combo is like icing on the cake. So sick and stylish, they flex just a little and act like shock absorbers for the wrists when riding over rough terrain. When Sprinting or skidding they are solid as a rock, def one of my favorite parts of this build, I cut mine down just a little from the stock width to fit my shoulders. This ZIPP wheel set is one of my favorites and a bit of an oddity. When MASH worked with Philwood on our 10 year anniversary hubs we had them produced with 32 holes, because we (slightly) value durability over speed. However we didn't really think about how modern carbon rims have come a long way and are now as durable if not more than alloy rims. The only issue being there were an almost nonexistent choices for 32h carbon rims (out side of the MTB world). ZIPP however was intrigued enough to work on this wheel set with me, I wanted the ultimate street wheel set. ZIPP custom drilled a pair of their 202 rims for 32 holes then had their master wheel builder lace them up in Indianapolis. With the fixed/fixed Philwood hub (17t & 15t) , locking security bolts from a local SF fabricator, and some Continental rubber (4000s 700x25 front Super sport Contact 700x28 rear) these wheel have been kicking it hard for the last 3 years and show no sign of slowing down, although they do have a few holes in the carbon LOL. I consider myself a bit of a purist when it comes to my track cranks, but not my rings. I have ridden plenty of outboard bearing track cranks and while they are all great, I still prefer the look and feel of old loose ball NJS track cranks and BB's. I know these Sugino 75's flex more then some cranks, but I kind of like that feedback from my bike. Paired with the 44RN 47t I think they fit in perfectly with the smoked paint job of the work frame. I was really trying to figure out a way to customize toe straps a few years ago and I used these Cadence straps as testers for various techniques, I never really figured out one I liked but they straps have help up well since then. I still ride Pinehurst road almost every day, but now when I do I imagine new skid lines around the corners and get really stoked that I have a little ring to shift into when I get to the steepest of hairpins. Don't let things get boring, try and look at them from a different perspective, get stoked, stay stoked, shred hard. Huge thanks to Francois LeBeau for waking up early and hanging out all morning with me while I nerded out on different lines around the same corner for 30 minutes!